In this season opener by Ashton, the company looked, unsurprisingly, a little rusty. The usually flawless Murphy stutter-stepped in a seeming lack of concentration, and corps members' limbs collided. Gomes, however, was polished and serene, his timing precisely clicking with the score. James Whiteside was forceful and charismatic as the bad guy, relishing the melodrama. Joseph Gorak danced with crystal clarity and luminosity as the Goat, making the most of a small "tail" role. This ballet ranks among the rep's lightest in tone and drama, augmented by Delibes' twinkling and sometimes saccharine score. It requires a focused delicacy and clear mindset, which were not quite present so early in the run. Alexei Ratmansky has already enriched ballet life in New York immeasurably in the decade or so that he's been here. But in Serenade after Plato's Symposium, he offers us a glimpse of a new facet of his work. The mostly male cast (Hee Seo has a brief cameo) showcases the new generation of men at ABT, led by veteran Herman Cornejo. Without women present, they need not worry about all their normal duties attendant in showcasing their partners: the requisite lifting (and getting a face full of tutu), spinning their partners, supporting, etc. 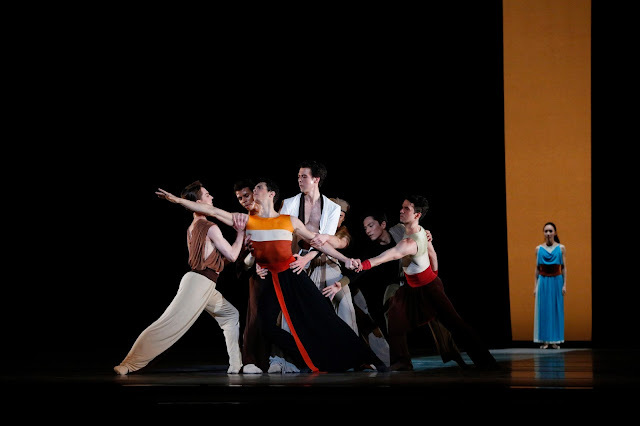 Ratmansky has given them elegant, front-and-center roles of seamlessly flowing phrases. Each man (Thomas Forster, Joseph Gorak, Alex Hammoudi, Arron Scott, and impressive corps members Tyler Maloney and Jose Sebastian) presents his own abstract version of love. It allows these men to reveal a welcome softer side not always indulged in classical ballet. The pseudonymous music is by Leonard Bernstein, and elicited curiosity, sadness, and playfulness, shifting toward the filmic in the latter part. Seo appears in an upstage portal as an angelic spirit, partnering with Alex Hammoudi for brief scenes, before exiting as she entered. At the end, she pops onstage from the side, beckoning the group from afar. Each of the men offers his own gifts, but Gorak seems most naturally suited to the precision and fluidity of Ratmansky's movement. This "Season of Ratmansky" at ABT includes two repertory programs, plus two full-length ballets by Ratmansky, including the premiere of The Golden Cockerel. It's about half of the two-month season dedicated to non-war horse ballets. This minor revolution is augmented by what feels like a sea change in the cast, which features young dancers who have been around for a while, but are now soloists dancing prominent parts that allow us to see their talent in full. Add to this newcomers, and injuries to a few key principals (Hallberg and Semionova, most significantly), and it's suddenly a new world at ABT. I recently read Julian Barnes' The Noise of Time, a fictionalized account of Shostakovich's life, thus when I watched the middle Chamber Symphony of Ratmansky's trilogy, certain passages had more impact than when I first saw it three years ago. These include: the man's (Jeffrey Cirio) weakness read as fatigue at combating the Soviet bureacracy; the pursuit of, rejection, and acceptance by women comprising his most important female relationships; and his moping exit symbolizing his failure through artistic compromise, which was misunderstood as artistic imperative. The revelation in Piano Concerto #1, the final part of the trilogy and its most dynamic, was Skylar Brandt as one of the two lead women, alongside Christine Shevchenko, as well as their partners Gabe Stone Shayer and Calvin Royal III. Brandt is a fireball, radiating energy and explosiveness; Shayer, muscular and eager, matches Brandt in these qualities. Royal fits the princely mode, statuesque and elegant. It's almost an afterthought that both men are not caucasian, but in light of the headlines made in recent seasons by Misty Copeland's ascendance to the principal rank, not insignificant. In fact the entire make-up of the company seems to have shifted to become far more racially diverse in just a year. It's a welcome turn. To underscore this generational sea change at ABT, its leading male dancer, Marcelo Gomes, portrayed the drag character role of Widow Simone in four performances of Ashton's Fille, whereas this might have been unthinkable just a year ago. This role is usually important, but still secondary to Lise (Gillian Murphy) and Colas (Cory Stearns). But Gomes enthusiastically seized the spotlight, waggling his bustled bum and giving the hilarious clog dance some extra stompiness. Murphy and Stearns gave believable urgency to the lovelorn pair, prevented from uniting by Simone. The most difficult feat was handily accomplished by the fine balancer, Murphy—she promenades in attitude on pointe, acting as the axle for ribbon spokes held by corps dancers, who walk in a circle. I still have no idea how it's done. A couple of chicken ballets, a pony, and lots of farm implements add delight to this ballet buffa that hasn't been danced by ABT in a decade.